OS X Lion’s Restore function is what causes app windows to re-open after you’ve relaunched an app, and people seem to either love it or hate it. Sure you can turn it off completely, but that’s a bit overkill if you only don’t want certain apps to restore their windows, and still want resume to work in others. 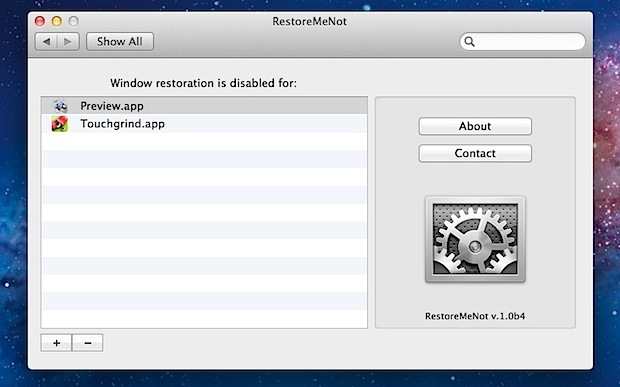 That is exactly what RestoreMeNot allows you to do; control which apps use window restore, and which don’t. This is easily done through RestoreMeNot’s preference panel list, where anything added to it will disable the feature when you relaunch the app. Apps like this are probably the best solution to use if you’re not comfortable with using defaults write commands to disable Resume on a per application basis, and you don’t want to disable the feature completely via System Preferences. Quick note: If you get a message telling you to launch an app first, that’s because it relies on the saved state folders existing. This is much in the same way of manually blocking restore works when you lock down the individual saved state directories, but of course if they don’t exist, they can’t be locked. Great program, added iWork and Microsoft Office 2011 to not restore because it is really annoying for those programs. I’ll go ahead and ask the obvious question: Why doesn’t Apple include such a preference pane themselves? That would be nice, wouldn’t it? I installed RestoreMeNot. It did no do what I (wrongly) expected it to do. I was looking for an option to set selected programmes not to launch at when booting after a shut down. I wrote an AppleScript to run before shutdown to quit all programmes, which I do not regularly use. I have not been able to run properly (so far). I was expecting the same thing. This only prevents saved states from being restored, it doesn’t block the program at startup. What I’m looking for is an application that prevents programs from launching after a shut down. Word for instance is terrible because it will always open on the “new document” page, which is completely pointless. No, I don’t write a new document each time I start my computer ! Works like a charm, no more having to close numerous excel docs to get to the one I was opening!